Be prepared to say "domo arigato!" 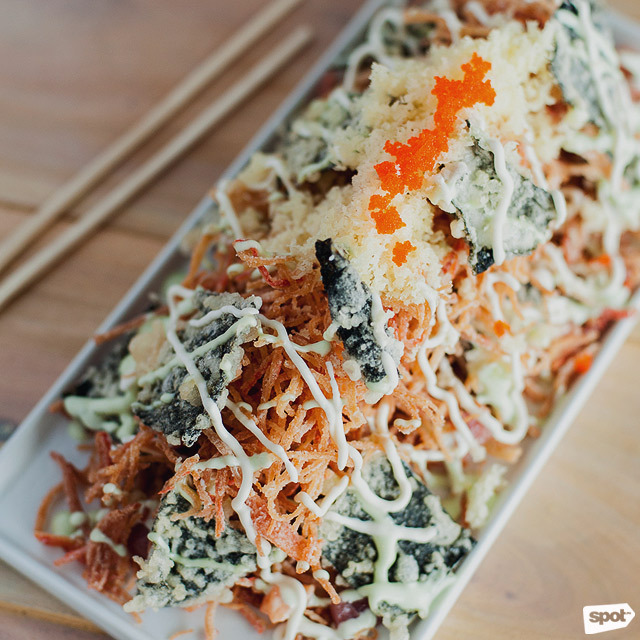 (SPOT.ph) It’s hard to miss Mr. Roboto. The restaurant has huge glass windows that show off its mostly Japanese robot-themed interiors (we say mostly because Futurama’s Bender is somewhere in there, too). 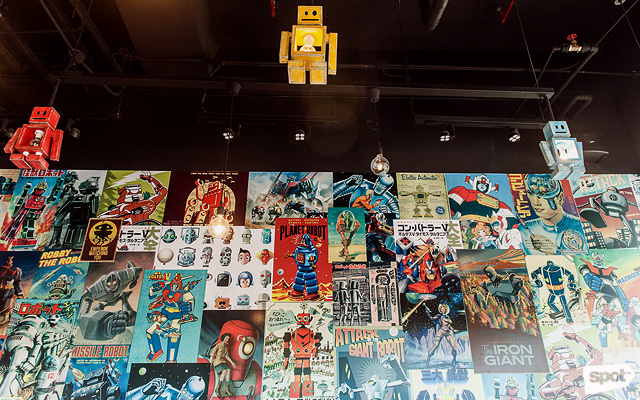 The top portion of its main wall is covered in a collage of vintage cartoon robot posters, the white space below it studded at regular intervals with the masks of popular mechas. Painted wooden robot wireframes hang on the ceiling alongside light fixtures. Patrons at Mr. Roboto dine to upbeat ‘80s music, unobtrusive enough so that you can have a conversation with friends using your indoor voices, but noticeable enough so none of you will be able to resist bobbing your heads happily while doing so. The whole thing is guaranteed to turn Martial Law babies into puddles of nostalgia. 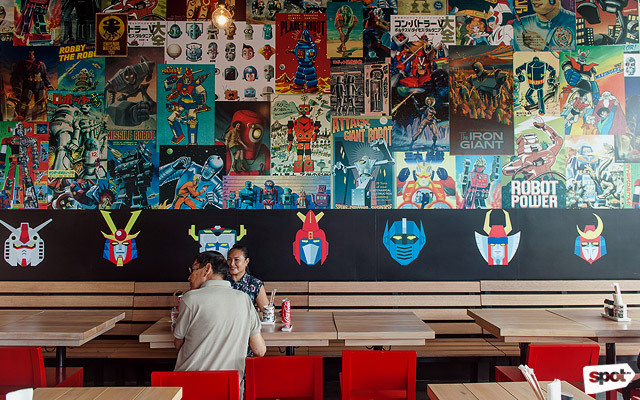 Mr. Roboto is run by Danni Ramos and David Mendoza, millennials whose exposure to mechas came via their dads. “The name was based on the song 'Mr. Roboto' by Styx. 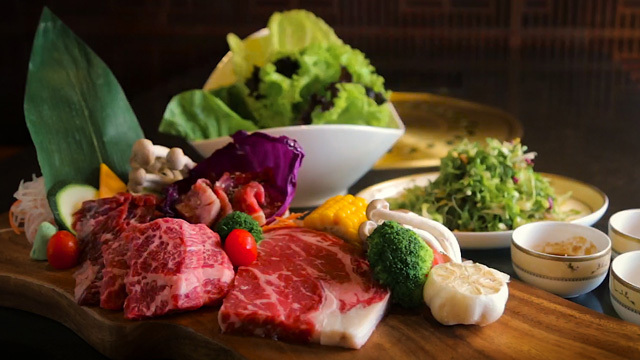 We wanted to go with something thematic because our restaurant wasn’t a traditional restaurant, so we didn’t want to give it a traditional Japanese name,” Mendoza, who manages the restaurant, says. The duo’s parents are business associates in Alabang culinary destination Neil’s Kitchen, where Ramos’ father is head chef and Mendoza’s parents are managing partners, so they had a lot of support and experience behind them. 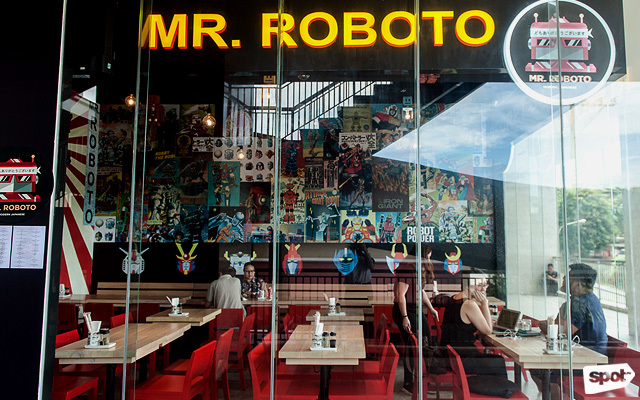 Mr. Roboto’s cuisine is as dazzling as its interiors. 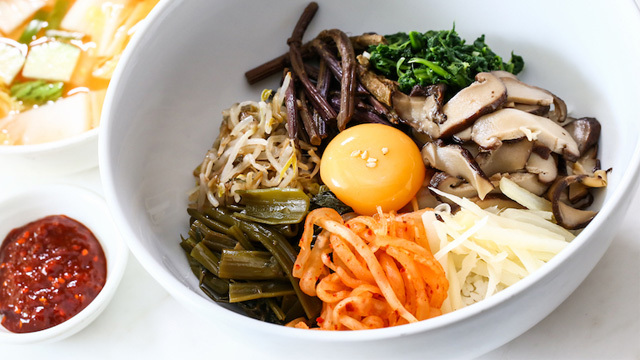 Servings are sizable, Instagram-friendly, and addictive—the restaurant isn’t even a month old and it already has regulars. So many customers have commented that it’s the kind of snack they want to eat while watching a movie that Ramos is currently working on portable packaging to make this request a reality. 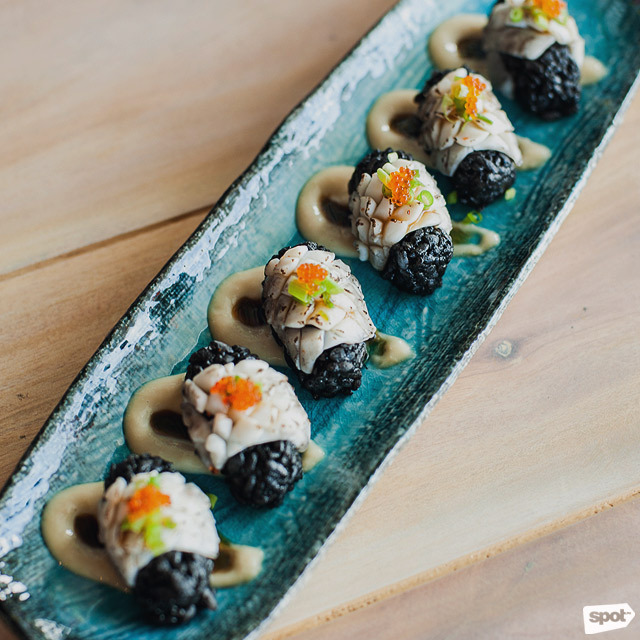 A must-try, even if you don’t like squid, is the Ika Nigiri (P220), squid ink sushi rice and torched (aburi) pickled squid topped with teriyaki sauce, negi (green onion), and ebiko. 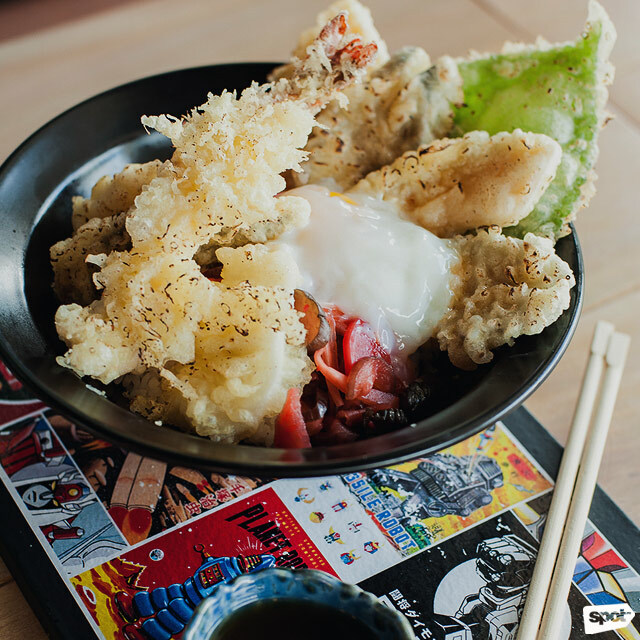 The squid is soft to the point of almost melting in your mouth. The black rice is umami-sweet, and the whole thing is touched with a hint of sour from the pickles. The sauces add another layer of richness. 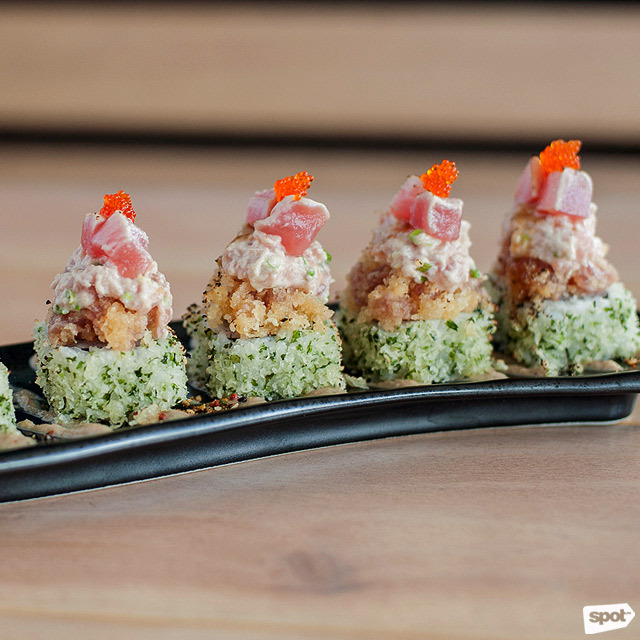 The pieces are small enough so that your senses don’t get overwhelmed and you lose interest in eating; on the contrary, there’s enough space in between bites (with one piece equaling one bite, as per the Japanese way) to make you want more. 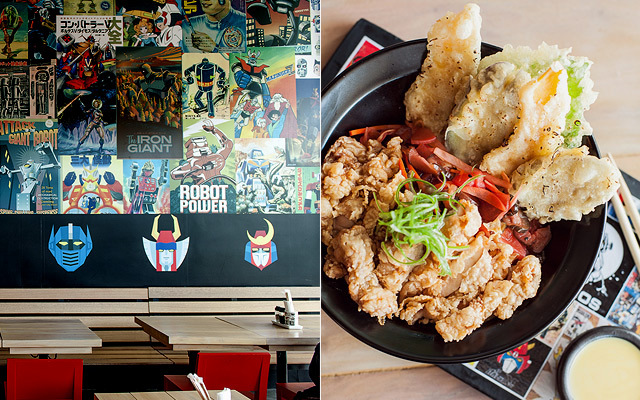 The Katsu is one of their more Instagram-friendly dishes—it’s served on a tray decorated with robot posters that mirror the ones on their wall, and is also served with a side of cheese sauce (made in-house), something that more restaurants should adopt. “The cheese sauce is just for people that want to try something different. When you add cheese sauce to your curry, it’s a completely different dish,” Ramos says. 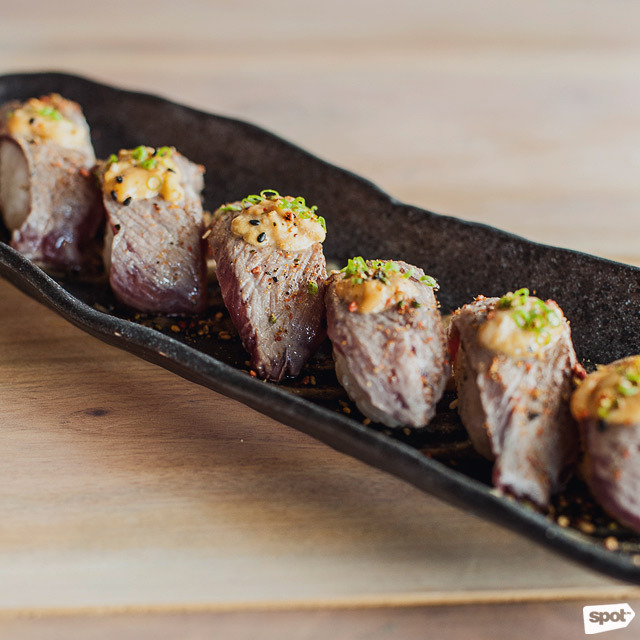 One such item is the Steak and Uni Nigiri, which doesn’t have a price and isn’t out yet, but is up there with the must-tries. 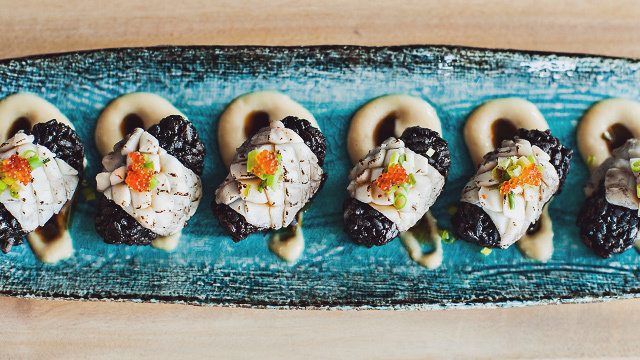 A lightly torched steak topped with uni and flavored with leek and mushroom sauce, it’s a Japanese take on Tournedos Rossini. 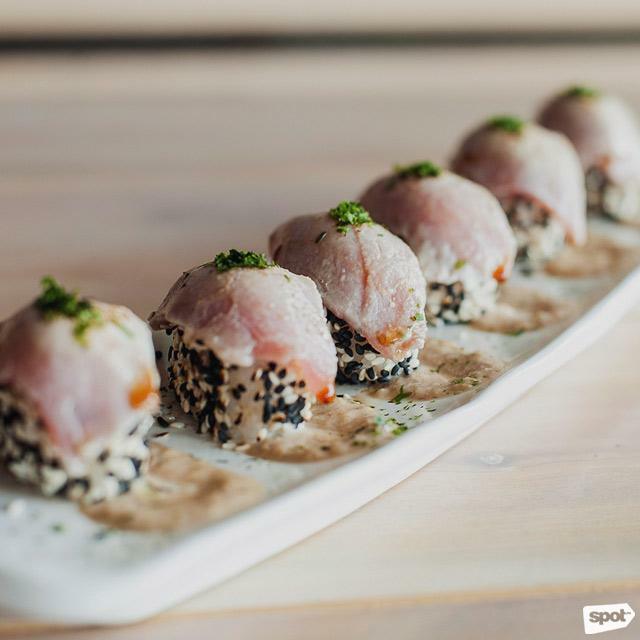 “This is our more umami nigiri and we want to work with steak because everyone love steak and we wanted to offer something that meat lovers can enjoy as much as the other nigiri,” Ramos says. It’s very rare that you come across a restaurant where everything you’ve ordered—during the soft opening, no less—is exceptional. 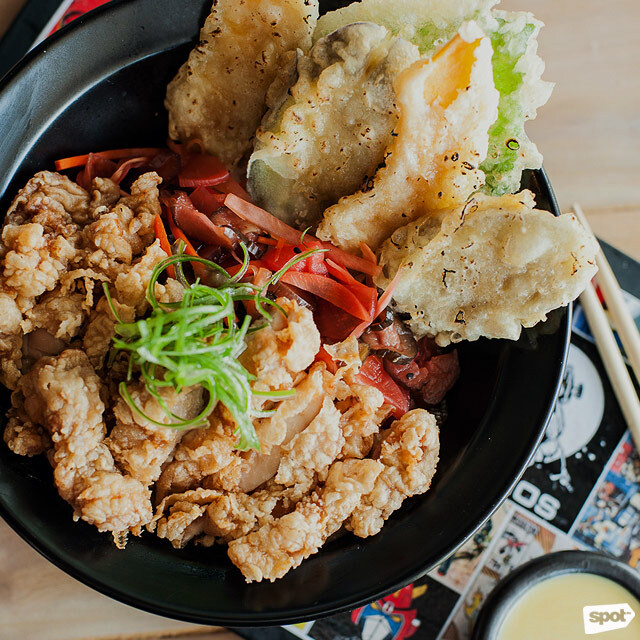 Mr. Roboto’s concept and cuisine are refreshing and well thought out. In a market saturated with restaurant concepts, it’s always a treat to come across a dining place that marches to its own quirky, tasty beat.